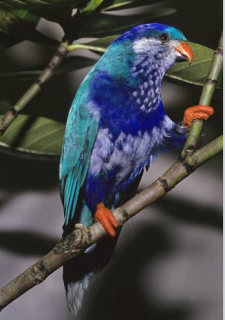 The Ultramarine Lory is one of only two small parrot species that are blue. Both adults small, mainly blue parrots, two-toned in colour; crown dark blue; upperparts dull blue, underparts white with dark blue mottling; dark blue/purple band across chest; thighs and undertail purple/blue; tail pale blue tipped with white. Bill orange tipped with black. Eye yellow/orange. As in adult but with underparts dark blue; paler sides and flanks; ear covers grey/white. Bill black. Eye dark brown. High-pitched short notes given in flight and at rest. Also described as strong screech or sharp whistle. Small, planted area or house heated to 15C or 60F. Nectar - commercial type for small species, or a mixture of baby cereal (lactose-free) and honey, malt extract or molasses, mixed with filtered water, made fresh once or twice daily; fruits such as: pear, apple, cactus fruits, pomegranates, kiwi, papaya. All islands where the lorikeets were formerly found have been devastated by overgrazing and fire. Introduced black rats were the main cause of the species' extirpation from some islands. Other invasive species that might be a threat include birds that may transmit diseases, and yellow crazy ants and Singapore ants. Restricted to Ua Huka, French Polynesia. Found above 700m (2296 ft), montane forest. Also has been seen in mixed forest plantations with coconut, hibiscus, banana, mango, breadfruit, and others. Feeds on flowers, and nectar of coconut and banana; buds, breadfruit (Artocarpus altilis) and mango (Mangifera sp.). Noisy and conspicuous in spite of low numbers; not as confiding as other Vini sp. Stays at or near top of forest canopy, constantly fluttering from tree to tree. 2 rounded eggs, 22.5 x 18.5mm (0.9 x 0.7 in).